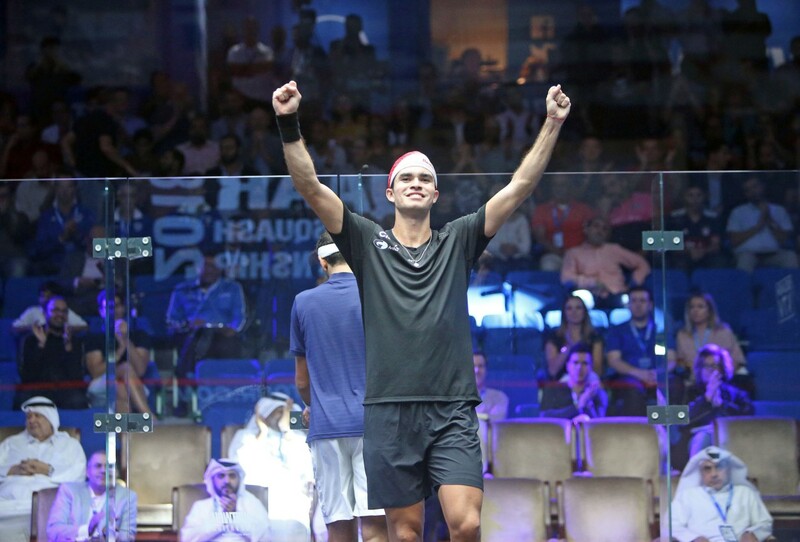 Egyptian Ali Farag, the 26-year-old from Cairo, delighted a partisan crowd inside the Khalifa Tennis & Squash Complex, Doha, today as he defeated Germany’s World No.5 Simon Rösner in straight games to win the 2018 Qatar Classic - marking his second PSA World Tour Platinum title victory. Farag’s defence of his maiden Platinum title win, the U.S. Open, was crushed by Rösner last month when the pair met in semi-finals of the 2018 edition of that event, but the World No.2 earned his revenge with a near faultless display to down Rösner 11-9, 11-7, 11-5. It was the German who began the stronger of the two, getting the better of Farag in the opening exchanges to open up a quick lead. But it was short-lived as Farag began to nullify Rösner’s mid-court dominance to level the opening game, and from that point on he went from strength to strength to complete the win after 46 minutes. “At the beginning I saw how crowed the venue was and the screams of the crowd were crazy which made me nervous - it took me a little while to calm my nerves down,” said Farag. “The atmosphere was beyond my imagination. Nothing I’ve played before was like that but mid-way through the first game I managed to settle and get into my game plan. “I tried to make sure that first game was long and that I wasn’t giving away any cheap points. I was behind and I didn’t think I would win that game, but coming through to win it made a huge psychological difference I think. “At the U.S. Open against Simon I became too passive, and if you do that he will kill you on court. You have to find that balance and I was able to do that from the second half of the first game all the way to the end today so I am very happy. Speaking after the match, Rösner said: “He was the better player today. I made a few errors - I hung in there, I tried very hard and gave everything I could, but he was just too good - but he deserves the win. I don’t have any regrets, getting to another final is huge for me. Obviously, you want to get those wins, but at the same time, you should be happy with what you have achieved. German World No.5 Simon Rösner and Egyptian World No.2 Ali Farag will go head-to-head in the final of the 2018 Qatar Classic after prevailing in their respective semi-final encounters against Peruvian Diego Elias and Egypt’s Tarek Momen in the Khalifa Tennis and Squash Complex, Doha earlier today. Rösner, the 30-year-old based in Paderborn, enjoyed a career breakthrough here last year when he reached the semi-finals at a Platinum level event for the first time to usher in what was the most successful season of his career to date. 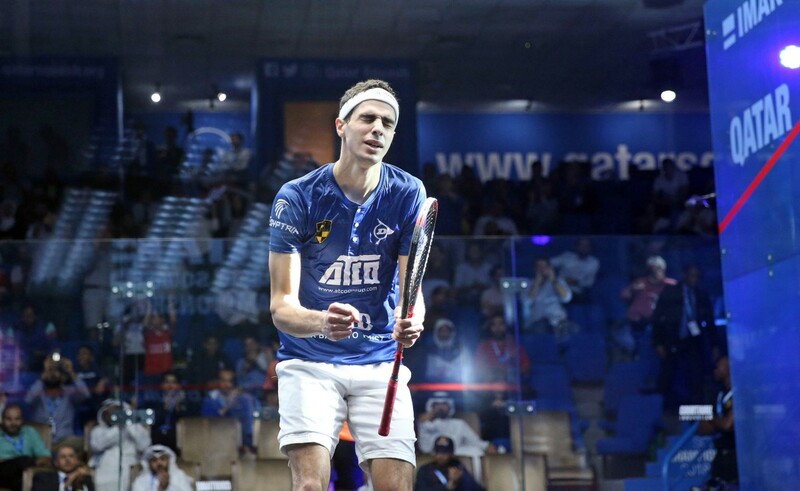 But he went one step better this time around as he easily brushed aside a tired looking Elias, with the 21-year-old struggling both mentally and physically to back up his victory over World No.1 Mohamed ElShorbagy yesterday. 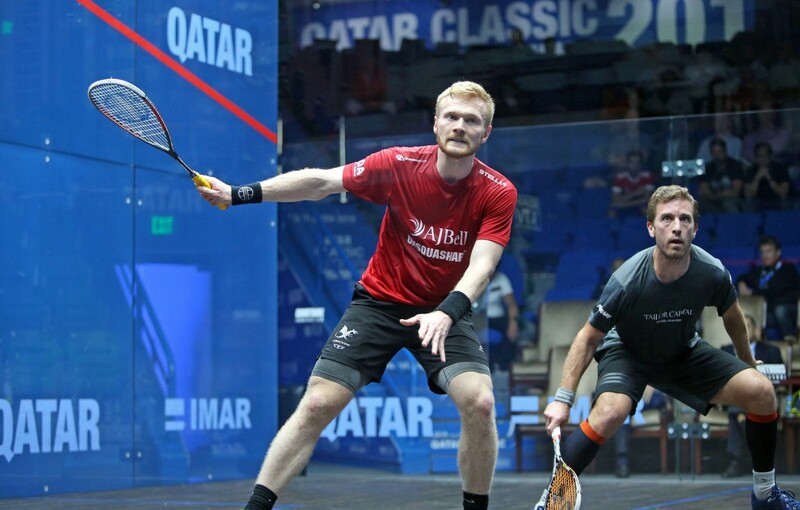 Elias looked flat from the off and Rösner, who finished runner-up at last month’s U.S. Open - the first Platinum event of season - was quick to grasp the opportunity and take control of the court to punish Elias at every opportunity and complete an 11-6, 11-3, 11-3 win in just 31-minutes. “Diego had a tough match yesterday, and it’s very hard to pick it up the next day,” said Rösner. “He beat the World No.1 to reach his first ever Platinum event semi-final and it’s a lot to take in. “I know what he is feeling because last year, I played my first semi-final here and I literally got chopped so I feel for him. “But for me, I’m playing my second Platinum final in a row. If you had told me that two months ago, I would probably have laughed, so I’m very happy. I will try and enjoy the moment tomorrow and play the best squash I can. “I feel like I’ve gotten better round-by-round this week and hopefully I can lift it to another level again tomorrow. Making two finals in a row is very special for me but there is another match to go and obviously you want to win those matches, not just be there for the sake of it. Farag meanwhile defeated compatriot, and 2017 tournament runner-up, Momen in a four game battle that saw them produce some sublime squash as they traded the opening games tat-for-tat whilst battling for control of the court. But, after losing the second, it was Farag who managed to gain the ascendency to force Momen onto the back foot and accelerate away to compete the win 11-9, 6-11, 11-6, 11-4 and avenge his defeat to Momen in the final of the Channel Vas Championships last week. 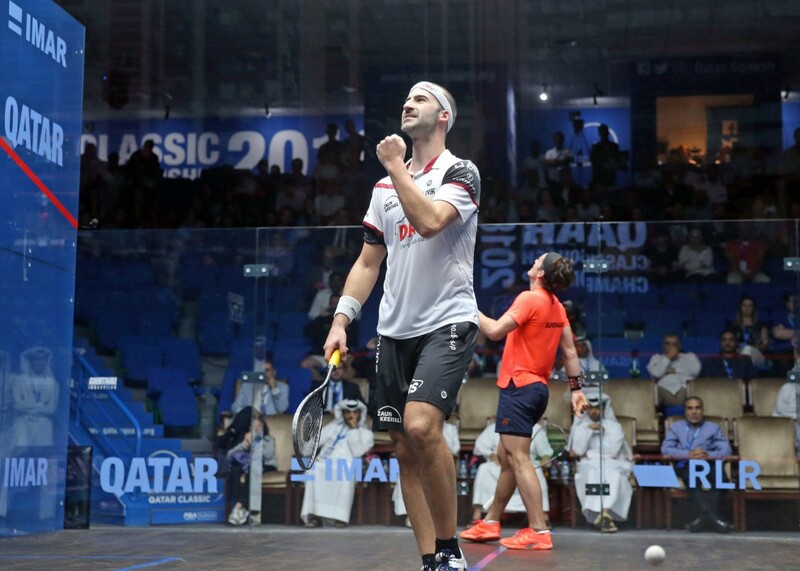 “It definitely wasn't easy at any point tonight, Tarek has been playing some of his best squash recently and he proved that with the win last week when he came from 2-1 down to beat me,” said Farag. “He was better than me on the day then but today I had a different plan and I think I executed it well, especially in the third and fourth games. I feel like I’m playing better event by event as well so I’m looking forward to tomorrow. The final will be played at 6:00pm local time tomorrow, November 2. 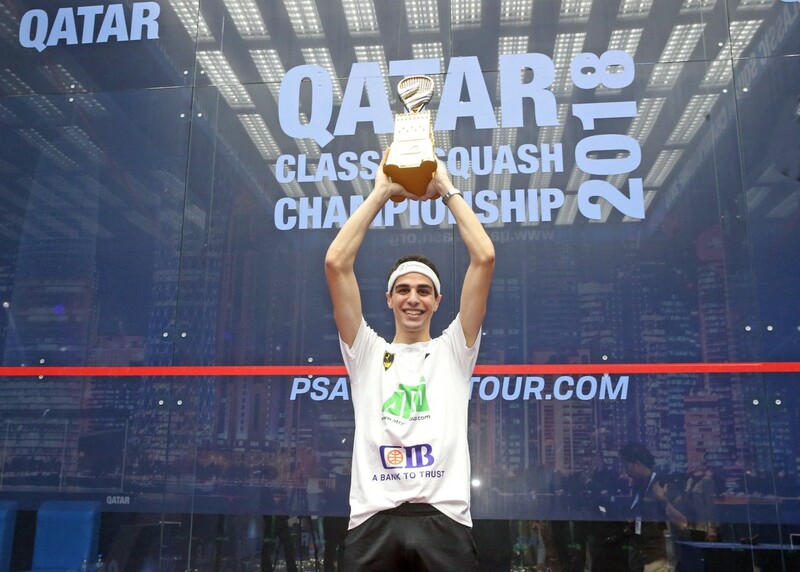 21-year-old Diego Elias produced the performance of his career to defeat World No.1 and World Champion Mohamed ElShorbagy in a thrilling 76-minute, five-game encounter to book his place in the semi-finals of the 2018 Qatar Classic and end the Egyptian’s defence of the PSA World Tour Platinum event. 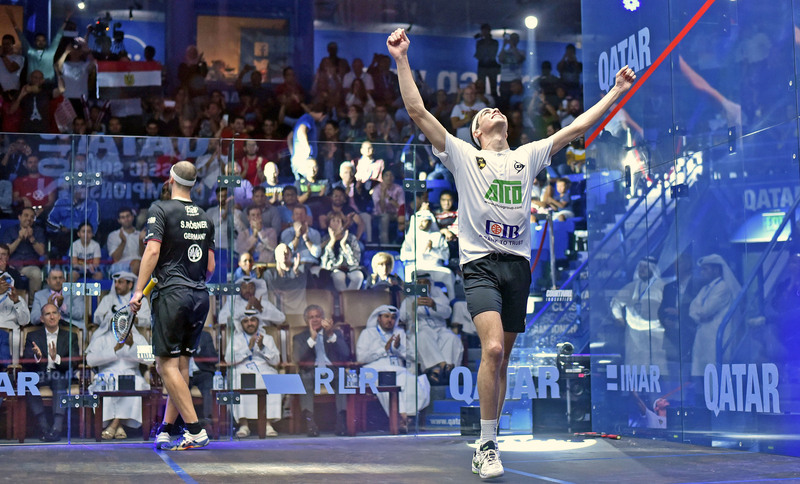 ElShorbagy, a three-time Qatar Classic winner, has maintained a stranglehold on the World No.1 ranking for the past three years but Elias produced an inspired performance to storm out of the gates and take the opening game courtesy of some sublime, patient squash. Lima-based Elias, who alongside ElShorbagy is one of only four players ever to win the World Junior Championship on two occasions, then managed to fight back after ElShorbagy twice nullified his game-lead on the scoreboard to come through an 11-8, 11-13, 13-11, 10-12, 11-7 winner and set up a last four meeting with Germany’s Simon Rösner - in what will be his first ever semi-final at a Platinum level event. “I’m really happy to be into the semis of a major event for the first time in my career and to do it by beating the World No.1 is special,” said Elias. “I have a big opportunity now and I don’t want to waste it so I will do everything I can to recover for tomorrow and come back and do my best against Rösner. It will be tough against him - we’ve only played once before and he smashed me - but I’m feeling good and hopefully I can play well. 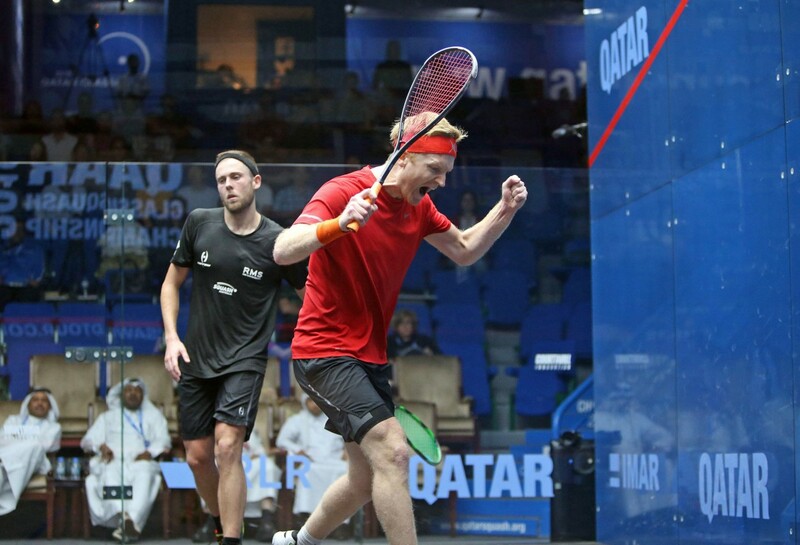 One year after reaching the semi-finals in Doha for the first time in his career, Rösner, the World No.5, booked his return to the last four with a well-earned 3-1 victory over New Zealand’s Paul Coll while the second semi-final will see Egyptian duo Ali Farag, the World No.2, and Tarek Momen, the World No.4 and 2017 tournament runner-up, clash just one week after they contest the final of the Channel Vas Championship. Farag dispatched 2016 tournament winner Karim Abdel Gawad in straight-games to book his last four spot while Momen was forced to produce some of his best squash to halt the giant-killing run of Welsh World No.33 Joel Makin. 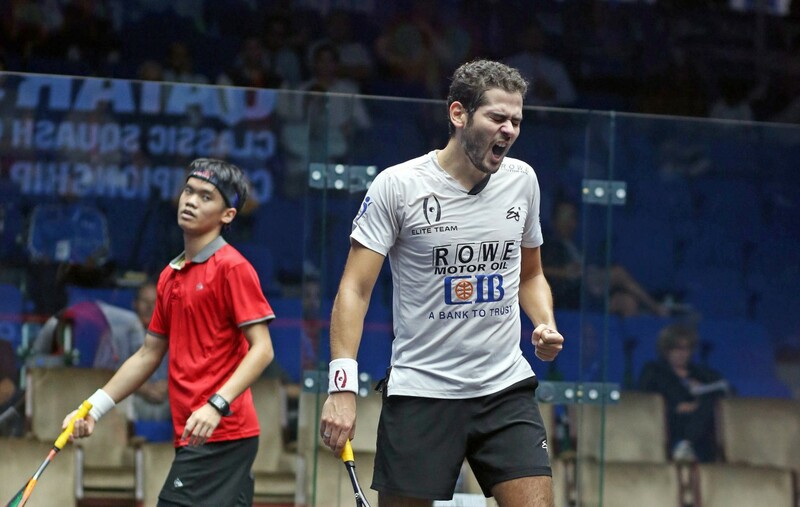 Momen found himself one-game down as Makin replicated the kind of squash that powered him to victories over World No.6 Miguel Angel Rodriguez and former World No.6 Mathieu Castagnet in the previous round but the Cairo-based player managed to turn the match around and come through after 51-thrilling minutes. “Joel is a machine - he’s spent so much time on court this week and I didn’t think he’d be able to back up so much,” said Momen. “He really exceeded my expectations and I had to pull out my best to win today. I am just really glad to be through and that it didn’t go to five because I know I need to recover well and be ready for the match against Ali tomorrow. 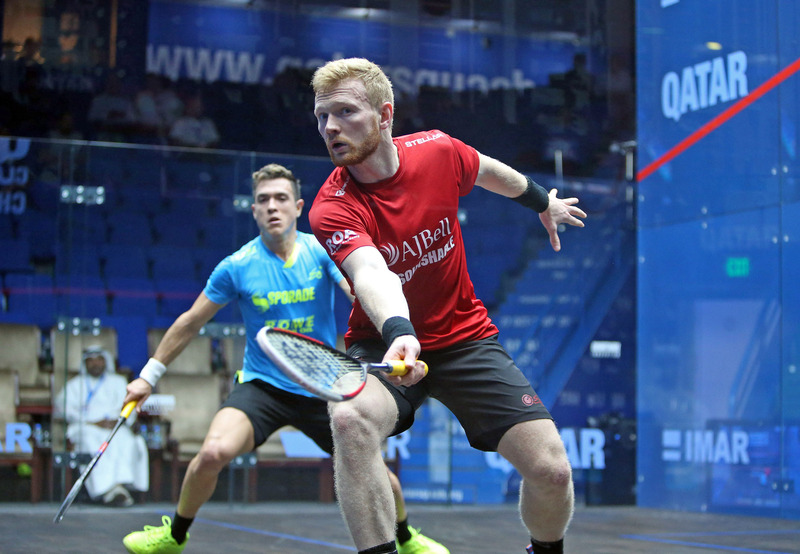 Welsh number one, and World No.33, Joel Makin will compete in the quarter-finals of a PSA World Tour Platinum event for the first time in his career tomorrow following his third round defeat of Frenchman Mathieu Castagnet at the 2018 Qatar Classic - a victory that comes just 24-hours after the 24-year-old shocked Colombian World No.6 Miguel Angel Rodriguez in the second round. 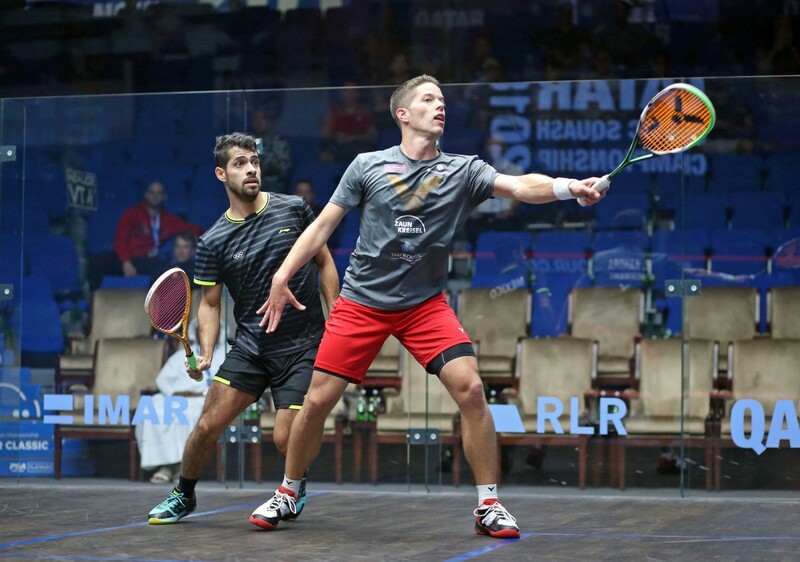 “Declan gave me a very hard time on there today - that was a very, very tough match,” said Gawad. 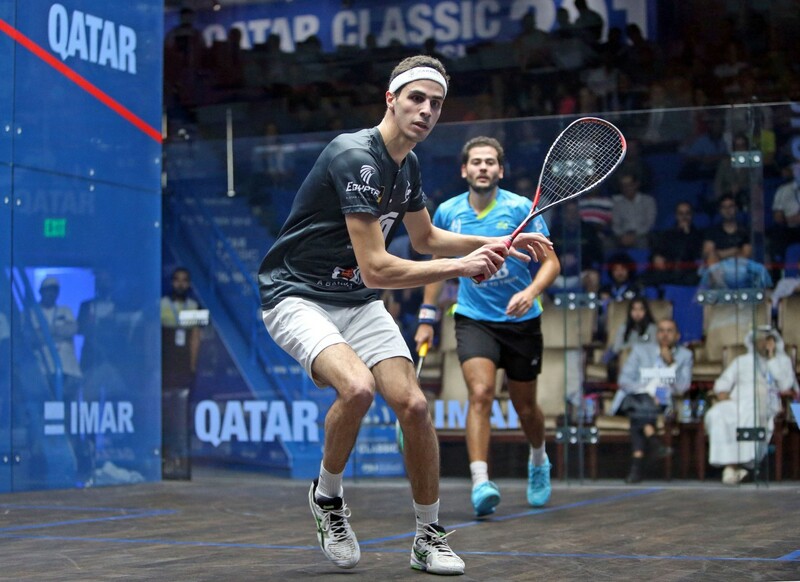 Lima-based Elias, the World No.13, was a quarter-finalist here last year and showed signs of returning to some of his best form as he swept aside Hesham - one of the most gifted players on the PSA World Tour - with ease, prevailing 11-7, 11-6, 11-5 in just 36-minutes. “The key today was the warm up - I had to be ready for him from the start because he’s the kind of player who can send you five directions in one rally,” said Elias. 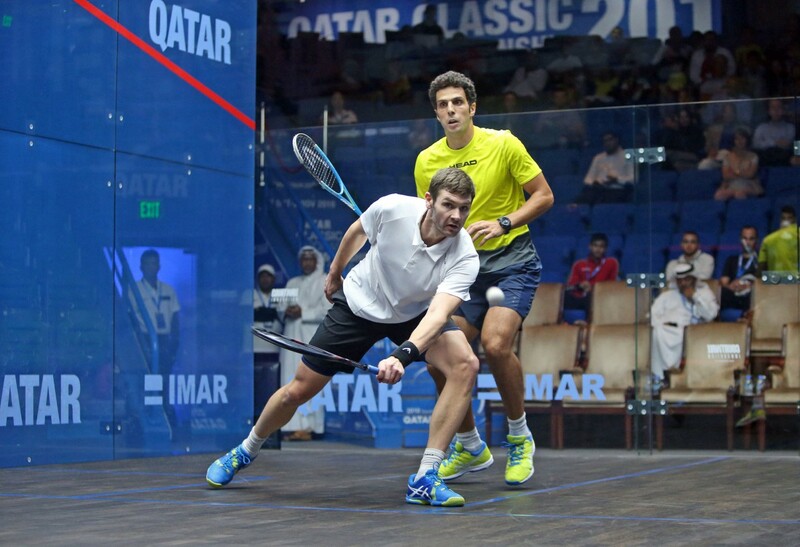 World No.33 Joel Makin, the 24-year-old from Pembrokeshire, Wales, shocked Colombian World No.6 Miguel Angel Rodriguez in a thrilling 106-minute encounter to reach the third round of the 2018 Qatar Classic PSA World Tour Platinum event taking place in Doha on a day of action that also saw World No.2 Ali Farag and World No.10 Karim Abdel Gawad narrowly escape second round defeats. Makin pulled off one of the biggest wins of his career last week at the Channel Vas Championship and proved that result was no fluke as he out-hustled and out-played the tenacious Rodriguez, winner of the 2018 British Open, to secure his place in the third round of a major PSA event for just the second time in his career courtesy of an 11-4, 6-11, 11-7, 10-12, 11-9 triumph. He will now got up against Frenchman Mathieu Castagnet for a place in the quarter-finals of the tournament and the rising star says he is hungry to capitalise on the opportunity and go one step further than his round of sixteen finish at the U.S. Open earlier this month. “My first round match yesterday was tough but I felt like I got the win last week (over ElShorbagy) out of my system in that match and felt like I played much better today," said Makin. "I knew I had to be so patient today because if you open the court up too soon against Miguel he has such quick reactions and can hurt you from anywhere. "I was just trying to slow the ball down and take the pace out of the game. I had to be disciplined, and maybe it was a bit boring at the end, but it was all about controlling the pace when I wanted it, not when he decided it. "I feel like I’m getting good wins and getting close to reaching the latter stages of tournaments at the moment. Today was a big ranking win for me and one that could mean me going into the last eight, so I will do what I can to try and make that happen in a few days because I want to be competing day in day out with the top guys." Castagnet secured his third round spot with a 3-0 win over Australia’s Cameron Pilley while 2016 tournament winner and former World No.1 Karim Abdel Gawad used his get out of jail free card to come from two-games down to beat Malaysian former World Junior Champion Eain Yow NG 3-2. NG had beaten local favourite Abdulla Al Tamimi in the first round and picked up where he left off as he produced squash of the highest calibre in the opening games to leave Gawad, the World No.10 from Giza, searching for a way to stop the onslaught - which he duly found to turn the match upside down and keep alive his hopes of winning the title for the second time in his career. "You do not become Junior World Champion if you are not very good, strong and skilful and he made it a very tough battle for me today," said Gawad. "I didn’t start positive, I was weak. But I used my experience today to be tough on court and I'm very relieved to be into the next round - where I know I have to play better." Gawad will now go up against England’s Declan James after the Nottingham-based player beat Karim Ali Fathi in straight games while tournament second seed Ali Farag will face India’s Saurav Ghosal after coming through a thrilling battle with compatriot Mohamed Abouelghar in what was a match of the season contender. 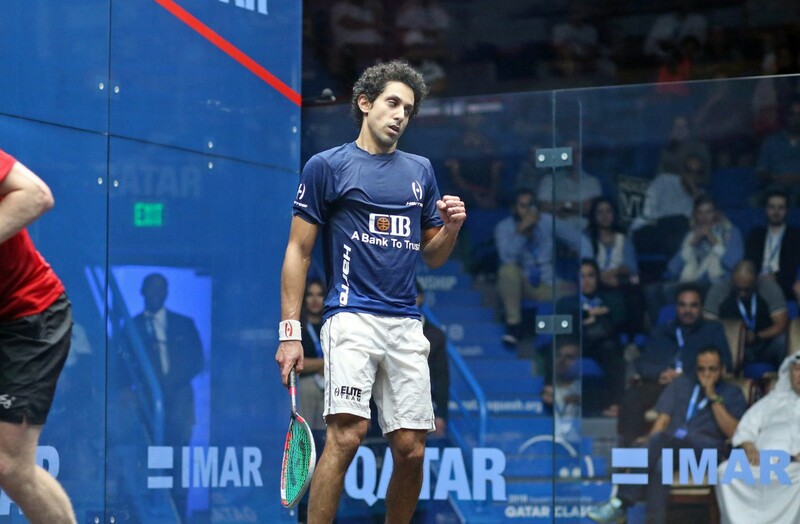 For long spells Farag was powerless to stop the attacking barrage coming from the racket of Abouelghar but his persistence and grit paid off in the crucial fifth game when, tied at 9-9, he managed to sneak two decisive rallies to escape from the clutches of defeat. 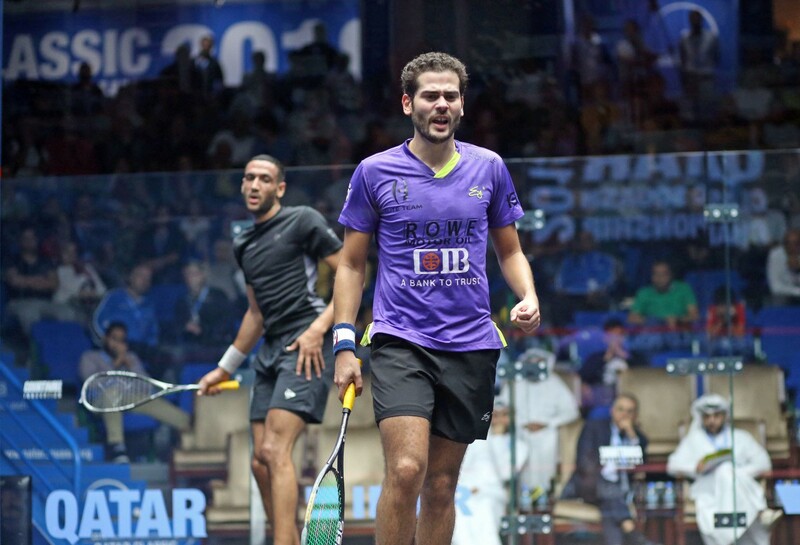 “I don’t know how I won that, I think I just got lucky at the end,” said Farag afterwards. The third round of the PSA World Tour Platinum event will be played tomorrow, October 30. 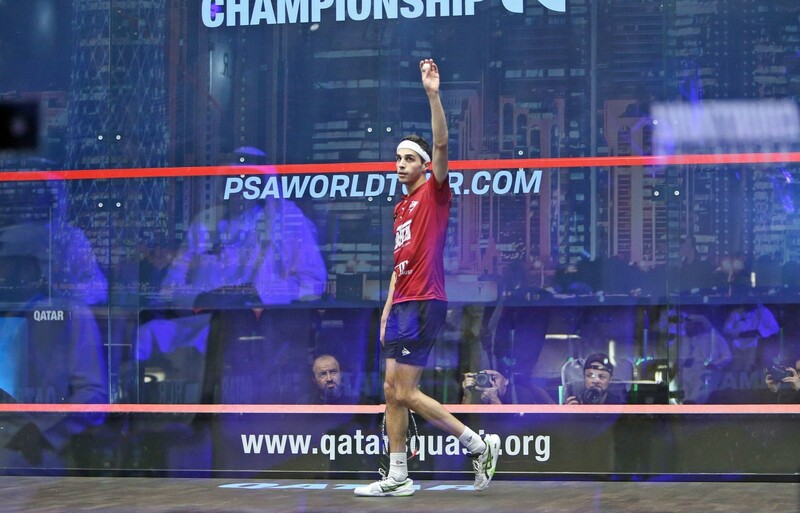 World No.1 Mohamed ElShorbagy, the 27-year-old from Egypt, began his bid to retain the Qatar Classic crown with a comfortable defeat of Hong Kong’s Tsz Fung Yip to book his berth in the third round of the PSA World Tour Platinum event currently taking place in Doha. 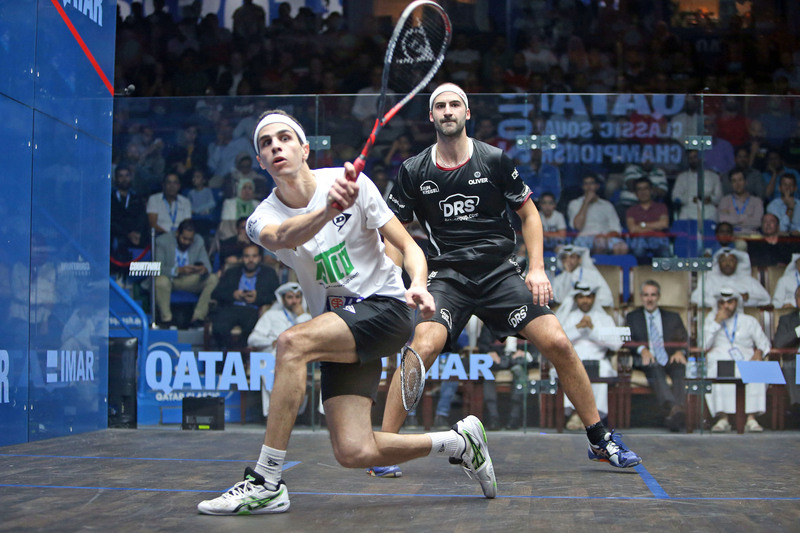 ElShorbagy, who is searching for his fourth Qatar Classic title after triumphing here in 2013, 2015 and 2017, was in cruise control early on as he swept aside World No.27 Yip in a dominant 11-3 opening game, before quickly doubling his lead with an 11-9 second game. But the man from Alexandria didn’t have it all his own way and was guilty of a lapse in concentration which cost him the third game. Yip, buoyed by getting a game to his name, then pressed ElShorbagy in the fourth and at times had the hard-hitting Egyptian on the back foot. But ElShorbagy managed to do just enough to stem the tide and prevail 11-3, 11-9, 6-11, 11-9 to set up a meeting with England’s Adrian Waller after the 28-year-old scored a surprise upset over former World No.3 Omar Mosaad. “That was the first time I’ve ever played against him (Yip) so I was not sure what to expect but I know how good he is and he played very well,” said ElShorbagy. “He’s shown great potential and I think he will go up the rankings in future for sure but for me, I have to make sure I stay positive for the rest of the season. There are a lot of players out there that are playing really well at the moment, so I have to stay hungry and motivated. “When you have a hard day, you just need to stop and remember why you started in the first place. Meanwhile Waller, the World No.36 from Enfield, England, cruised to a surprise last sixteen berth as he dominated 2016 World Championship runner-up Omar Mosaad to record an empathic 11-0, 11-2, 11-5 win that saw him restrict the powerful Egyptian to just seven points in total and record one of the biggest wins of his career. Speaking after the match Waller said: “I don’t know how I did that - I was just concentrating on my game and the score took care of itself really. “I don’t think Omar was at his best today but it was nice to take advantage of the opportunity. I just tried to not let him into the game and the lead in the second game allowed me to relax and loosen up which gave me a dominant position. Waller’s compatriot Tom Richards, the World No.30, also scored an upset victory to book his place in the third round of the event for the first time in his career as he overcame World No.16 Ryan Cuskelly of Australia courtesy of a clinical performance that saw him reproducing the kind of free-flowing squash that took him to a high of World No.12 back in 2013. The 32-year-old responded from losing the opening game to prevail 5-11, 11-7, 11-5, 11-7 and set up a second round encounter with Germany’s Simon Rösner. “It means a lot to win today and reach the third round,” said Richards. The other winners on the first day of second round action were Peruvian Diego Elias, New Zealand’s Paul Coll, Spaniard Borja Golan and Egyptian Mazen Hesham. Action from the second round continues tomorrow, October 29. 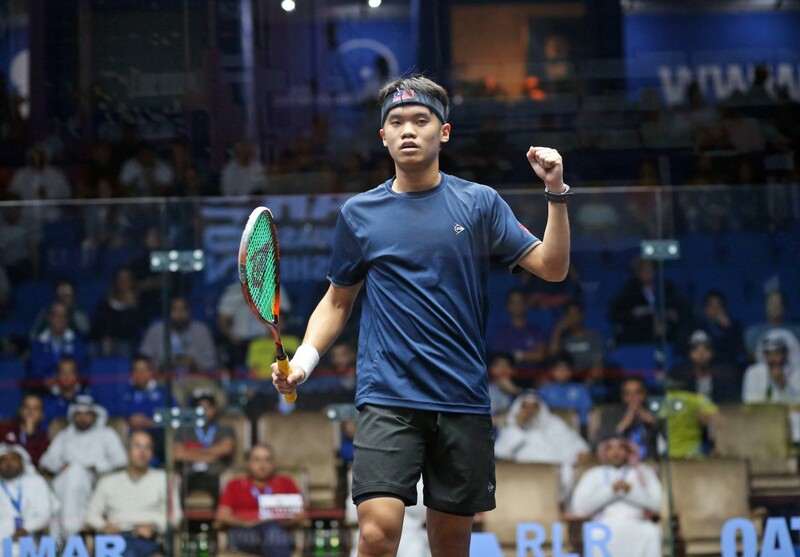 Competing in the first round of a major PSA World Tour Platinum event for just the second time, Malaysia’s 20-year-old Eain Yow NG sealed one of the biggest victories of his career to knock home favourite and World No.24 Abdulla Mohd Al Tamimi out of the 2018 Qatar Classic at the first hurdle - on a day that saw all three competing Qatari players crash out of the event. Taking on the talented Tamimi in his own back yard, NG embraced the underdog role and attacked without fear from the off. Playing with a relaxed, composed manner the World No.42 took the game to the local man, forcing errors from the racket of a nervous Tamimi to take the opening game for the loss of just three points. Tamimi, currently at a career high ranking, looked to have found his rhythm as he levelled the scores. But the errors began to flow once again in the third game, with NG happy to profit and re-establish his lead. He then came from behind in the fourth game to seal the win and book a place in the second round of a major event for the first time in his career. “I knew coming into it today it would be tough to play him in his home town so I just told myself that there was no pressure and to relax and enjoy the match,” said NG, who led Malaysia to a Gold medal finish at the Asian Games Team Championship. “He’s a very talented and tricky player, so I just had to play basic, keep the ball tight and stay focused. I knew there would be pressure on him and in the first game I could see he was a bit slow of the mark and I tried to take advantage of that and the first game was very important. “I fought back very well in the third game after being down and I just kept focusing on trying to play good squash instead of getting sucked into his type of game. I believed that I could do it and it paid off for me at the end. NG will go up against former World Champion and 2016 tournament winner Karim Abdel Gawad in the second round while Qatari wildcards Abdulrahman Al-Malki and Syed Azlan Amjad also bowed out at the first round courtesy of straight-game defeats at the hands of Australian Cameron Pilley - who today celebrated his 36th birthday - and Hong Kong’s Tsz Fung Yip. 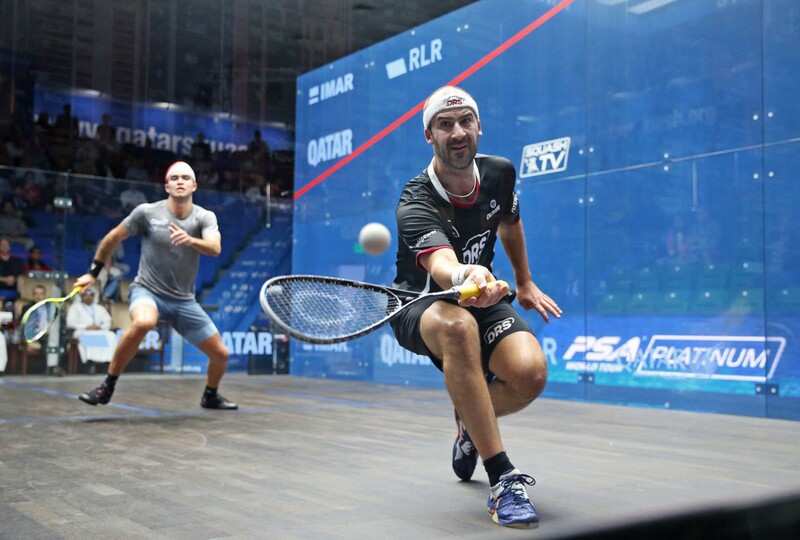 Elsewhere German number two Raphael Kandra was one of six players to narrowly come through in five games and secure a place in the second round of the PSA World Tour Platinum event, with the 27-year-old coming from behind to see off Mexican Arturo Salazar in a thrilling encounter. Kandra, playing at a career high ranking of 19, was off the pace to start with but managed to turn the match around and prevail against the dangerous Salazar - who’s brother Cesar saved match ball to triumph in another five-game battle with Welshman Peter Creed. “I wasn’t that comfortable on the glass court to start with today but the longer it went on the better I felt,” said Kandra afterwards. Egypt’s World No.45 Karim Ali Fathi also produced a surprise win on the opening day of action as he secured a 3-0 victory over France’s World No.31 Gregoire Marche while Mazen Hesham, Greg Lobban, Adrian Waller, Tom Richards, Borja Golan, George Parker, Mathieu Castagnet, Declan James and Joel Makin were the other winners on the day. World No.1 Mohamed ElShorbagy is relishing the prospect of defending his Qatar Classic title between October 27 - November 2 and says that he feels at home at the Khalifa International Tennis & Squash Complex after reaching six successive finals there. 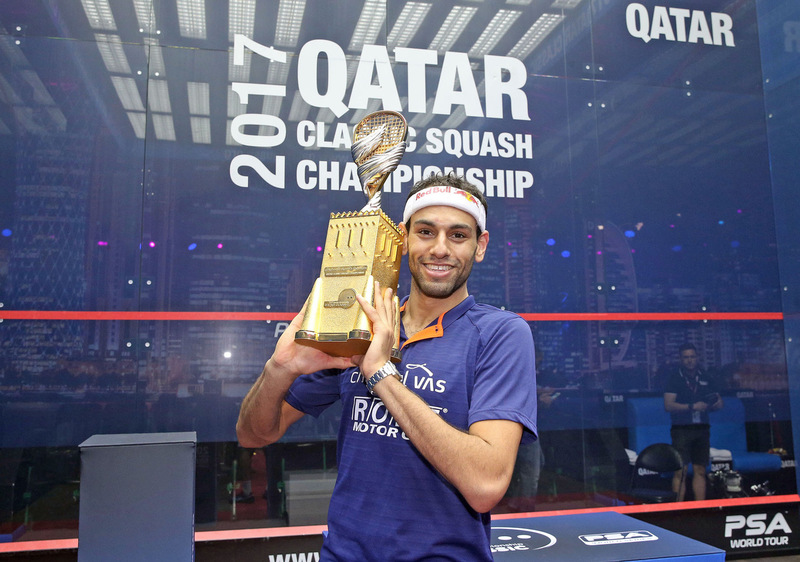 With three Qatar Classic titles to his name, ElShorbagy is the most successful player in the tournament’s history, and he also reached the World Championship final here on two occasions, in 2012 and 2014. The 27-year-old has a rich vein of form in Doha, winning 29 of his last 32 matches in the country’s capital, and he looking forward to returning to a location where he has dominated his opponents in recent years. "I always love playing there," said ElShorbagy. "I have made six finals in the last six years, so I always feel that if there is somewhere where I am the hardest to beat then it is definitely Qatar because I always feel at home on that court. If someone is going to beat me there then it will be like they have kicked me out of my home. “I really look forward to going back there and trying to defend my title. I had a tough draw there last year and I stepped up and won the tournament. I really hope I can go back there and do it one more time and let’s see what happens, there are a lot of good players right now playing really well but hopefully I will be up to the task and be able to defend my title." ElShorbagy's title win in Qatar last year was one of eight PSA Tour titles the Bristol-based Egyptian picked up during a dominant 2017/18 campaign, with a 3-1 victory over fellow Egyptian Tarek Momen seeing him capture his third trophy in Qatar. He started this season with a final appearance at the Oracle NetSuite Open in San Francisco - where he lost out to World No.2 Ali Farag - before beating World No.5 Simon Rösner to win the U.S. Open a fortnight ago, and he is anticipating some strong challenges in Qatar as he bids to retain his crown. "It’s not going to be easy with how strong the draw is and each season it gets harder because each player studies me more and wants to beat me more," he said. "I try to get better each season too, it gives me a reason to get better each season. I have been World No.1 for three years exactly now and for me the greatest in each sport has consistency. The longer you stay, the longer they study you and find weaknesses, and the longer you stay at the top that means that you have been able to protect those weaknesses from being exposed as much as possible. ElShorbagy receives a bye through to round two, where he will play either Qatari No.2 Syed Azlan Amjad or Hong Kong’s Tsz Fung Yip. The Egyptian is drawn on the same side of the draw as World No.5 Simon Rösner and World No.8 Paul Coll, while Farag, Momen and World No.6 Miguel Angel Rodriguez are involved on the opposite side. A prize fund of $177,750 will be up for grabs, as will a place at the PSA World Tour Finals, with the winner automatically qualifying for the season-ending tournament. Entry is free for rounds one, two and three, while tickets can be purchased for the quarter-finals onwards from the tournament website.